League Against Cancer / Liga Contra el Cancer is a volunteer driven, non-profit organization, which provides FREE medical care to needy cancer-diagnosed patients, without regard to race, creed or national origin, provided that they have established legal residence in the State of Florida. At LIGA’s Medical Center – Chemo serves is on-going year around! Comprehensive Medical Care is FREE for all LIGA's cancer patients. In general, LIGA provides (FREE) from case review and social services to surgery, radiation therapy, chemotherapy, laboratory services and radiology, medication, prosthetics, home nursing and nurses aid services, home medical equipment, transportation, hospice care, breast and PAP screening, psychological support, and moral support to patients and their families. More than 150 doctors provide voluntary services to the League's patients. In addition, the staff is supported by a corps of over 200 full and part-time volunteers in the operation of the clinic. The strong involvement of volunteers keeps the administrative costs at about 12% of total costs, three times less than of a traditional doctor's office. 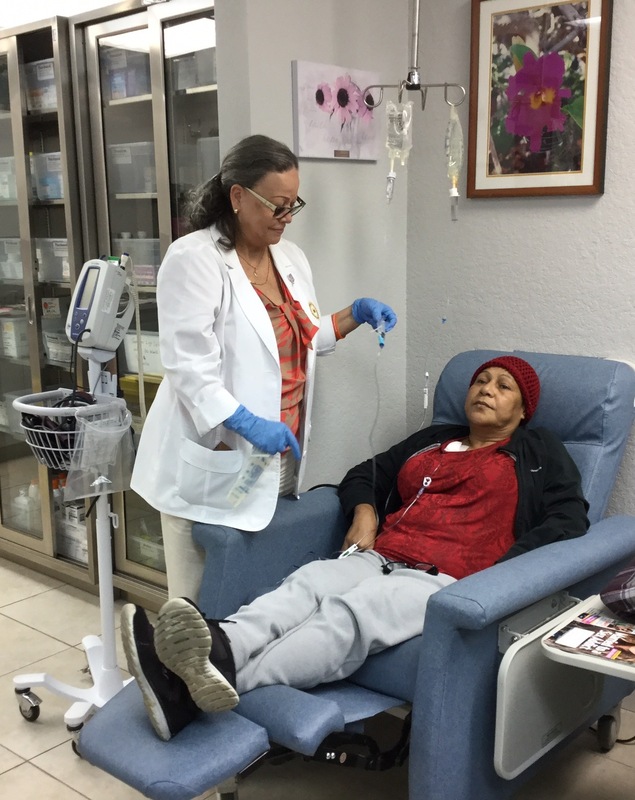 At LIGA’s Medical Center – Chemo serves is on-going year around! Complete Medical Care is FREE for the cancer patients. The League Against Cancer is committed to maximizing our benefactor’s contribution with the delivery of quality-driven, pragmatic and cost effective cancer care services. At the same time, while maintaining and ensuring fiscal responsibility, seeks additional revenue to be able to expand cancer care services to the uninsured population of Miami-Dade County. Volunteers from Palm Beach to South Miami-Dade County help the organization’s on-going fundraising efforts throughout the year. The main sources of income are the League's annual fund-raising telethon on Telemundo-WSCV Channel 51, state and county grants, an annual raffle and private donations. Many lives have been saved, much suffering has been spared, and many destitute cancer victims have been able to die with a level of dignity usually reserved for those who have medical insurance or personal wealth. Luncheon with patients! Thanks for your support! Telethon – Annual support from the Miami-Dade Police Hispanic Association to LIGA’s Cancer Patients. The League Against Cancer is committed to maximizing our benefactor’s contribution with the delivery of quality-driven, pragmatic and cost effective cancer care services. At the same time, while maintaining and ensuring fiscal responsibility, seeks additional revenue to be able to expand cancer care services to the uninsured population of Miami-Dade County. Thanks for your support!!! League Against Cancer/Liga Contra el Cancer's Medical Center serves as an intake and treatment facility for individuals who have been diagnosed with cancer. Once determined to be eligible for cancer related services, patients receive the appropriate treatment and follow-up services completely FREE of charge. Services are provided at LIGA's own facility, in private physician offices and at local hospitals/Medical Centers, depending on medical need. LIGA accepts patients - children and adults - without distinction of race, creed or nationality, provided that they have established legal residence in the State of Florida, thus saving hundreds of thousands of dollars to Florida’s tax payers. LIGA provides (FREE) from case review and social services to surgery, radiation therapy, chemotherapy, laboratory services and radiology, medication, prosthetics, home nursing and nurses aid services, home medical equipment, transportation, hospice care, breast and PAP screening, psychological support, and moral support to patients and their families. LIGA has served (including follow-up) over 65,182 persons from 50 countries, since its foundation in 1975. LIGA began keeping statistics in 1982 and since then as of December 31, 2016, we have provided over 25,838 Papanicolaou Tests (Pap Smears); 33,647 Chemotherapy & Radiotherapy treatments; over 154,546 laboratory tests, over 46,820 radiology procedures, including Scans, Mammograms, Ultrasound and MRI and 2,285 prostate screenings. League Against Cancer/Liga Contra el Cancer's provides FREE breast Cancer Examinations and Mammogram screening for low income women in South Florida. League Against Cancer/Liga Contra el Cancer's provides FREE PAP screening Examinations for low income women in South Florida. Mr. Cesar A. Scheker, M.B.A. Learn more about Liga Contra El Cancer Inc. League Against Cancer Inc.
Make a gift to League Against Cancer, Inc.